Written by Janet Choi on January 26, 2017 . Email is a core part of your product and brand. So anyone who cares about product engagement—from your PMs to designers to developers to marketers—should consider deploying lifecycle emails as a key component of the product experience. By sending product-centric emails instead of just acquisition-centric emails, you’ll be able to build long-term customer relationships at scale—a more valuable and powerful feat than only growing an email list. We’ll dive into each type of email and campaign and why they’re so important for improving your core product experience. No article on lifecycle email is complete without emphasizing the importance of segmenting your recipients. Whether you’re sending marketing-oriented top of funnel emails or product-oriented emails to your VIP customers—it’s important to personalize the experience as much as possible. When it comes to segmentation for product-oriented communication, you can draw on customer behavior data to make your messages more personal and relevant. Create dynamic segments based on people’s attributes and activities (or inactivities). This level of specificity may be intimidating at first, requiring insights, understandings, and hypotheses about your users, but the approach will be more fruitful than getting in the weeds with the traditional email marketing concerns of subject lines and scheduled send times. A segment of customers at risk of churn might rely on event data, for example, and look like this in the Customer.io platform: Then you’d use this segment to send a product-centric lifecycle email aiming to head off user churn. Segmenting your customers based on product or app data requires some thought around how user behavior correlates with your business objectives. And the more you can do to leverage communication to impact that behavior will help you unlock growth. Tech companies, by nature, require a scalable infrastructure. This includes automating certain types of messages to provide a great customer experience. Triggered email campaigns falls neatly into that category, helping to scale a personalized one-to-one feel in a thoughtful and intentional way, without people on your team having to spend time to reach out manually to individuals. Nowhere is this more true than internet messaging. In a world of limited attention and unlimited noise, new users start with little context and little motivation to use your product. When messages at this stage are blind to the problems that new users are facing, communications efforts may very well fail. 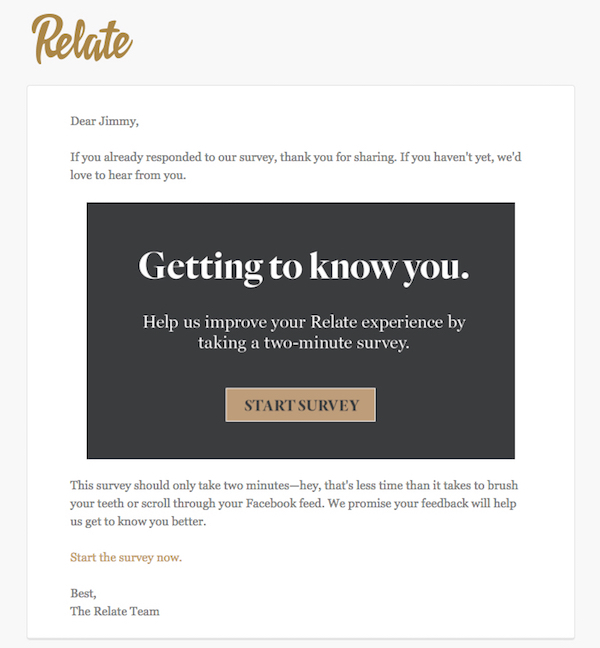 Cater your onboarding emails to the new customer, considering what they know (and don’t know), in order to deliver value from your product as soon as possible. 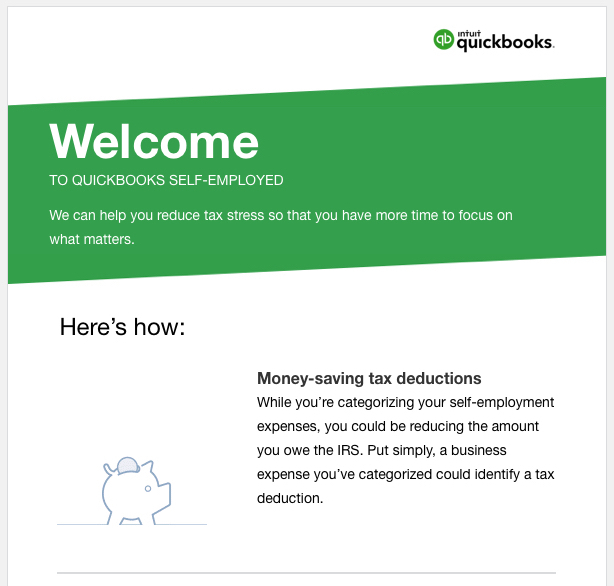 Take this example from Quickbooks. Upon signing up for a free trial, you’ll get a triggered email explaining many of the same points covered on the product’s feature page. click through to see full email Why re-iterate if you’ve already got the signup? Until the customer is achieving value over a long period of time, there’s likely to be a knowledge gap when it comes to your product, and you have to nudge customers more than once to reach their “Aha” moment. 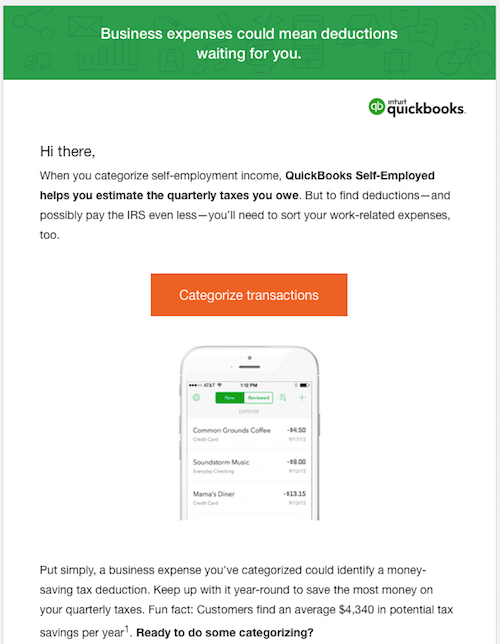 Quickbooks’s emails get more specific, based on both the features they’ve identified as valuable and actual customer behavior. 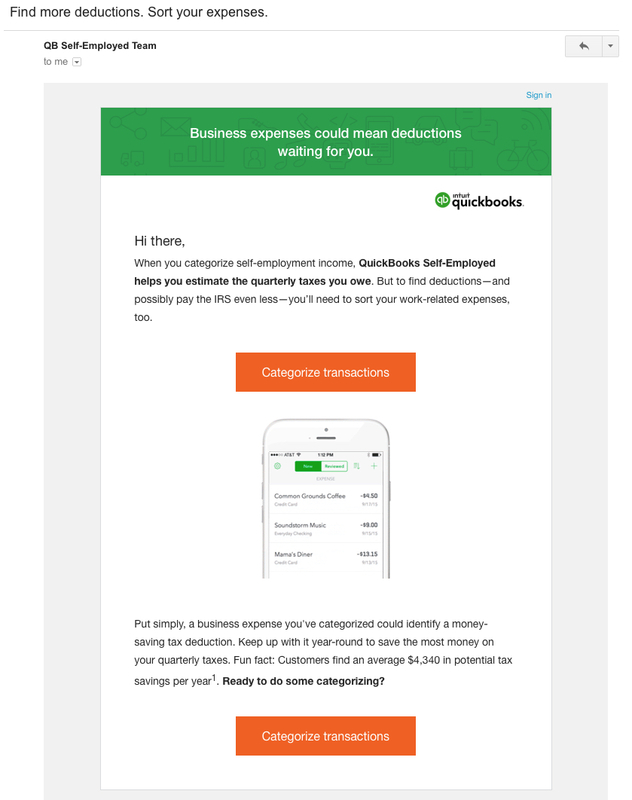 click through to see full email These emails look like smart retention efforts. Where does onboarding end and retention begin? The answer is: it doesn’t really matter. Label the first series of emails the customer receives as “onboarding” but assume you’re working on retaining from day one. The best retention strategy starts looooong before there’s a problem. 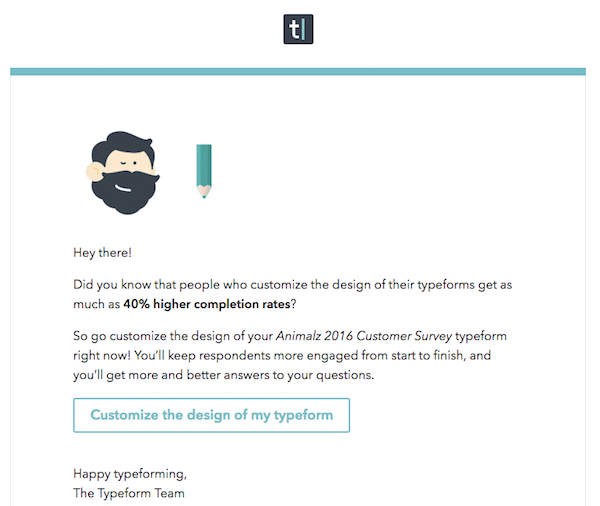 Typeform, send this message after a new free trial user creates, but doesn’t finish, their first survey. Get people engaged way before inactivity becomes a concern. When used correctly, notifications increase engagement and customer happiness. When used incorrectly, they annoy the heck out of people and drive them away. The deciding factor is whether you’re providing a useful signal versus ignorable noise. Are you adding insight and other benefits like saving time or effort for the recipient? Or are you not providing any value? Spotify’s notifications are a great example of useful signals. 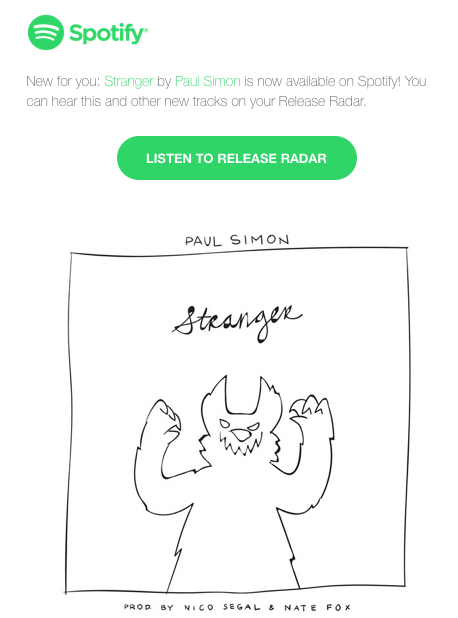 When an artist I like has new music available, I get a simple email like this: The notification not only keeps me in the know about a new release I’m bound to like (I love Paul Simon! ), there’s also a next step—a reason to go back to Spotify and listen to something specific. That curation of experience, given the loads and loads of choices in the app, can be pretty valuable. 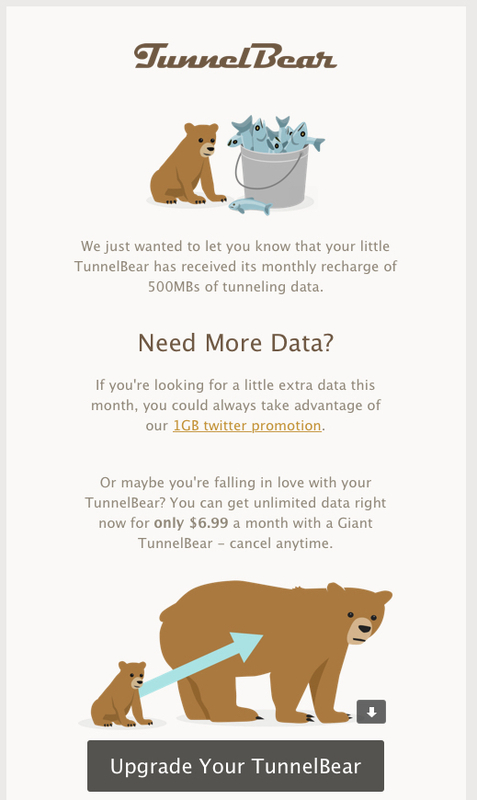 Here’s another example from TunnelBear, a VPN app, dropping a quick, timely update about when my account gets refilled with its monthly allotment of data. This email makes me feel confident that I’m getting what I signed up for, plus the TunnelBear crew is taking advantage of a smart window of opportunity to get me to increase my plan. Use notifications to deliver good vibes and value, and you’ll more likely to get a return on your investment. It’s simply good customer service and good business sense to share key product and feature announcements with the people using the product. Check out this example from Asana. 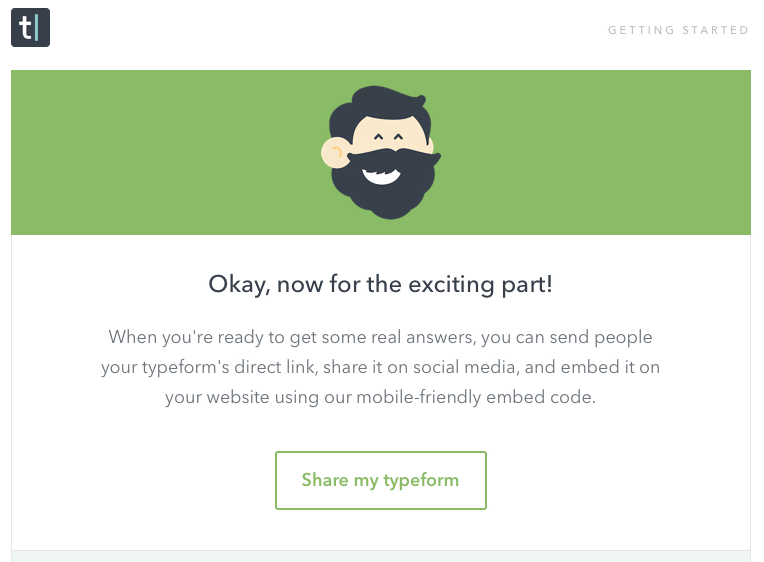 A simple GIF conveys how a new feature works and then the email closes with a clear call-to-action to try out what you just saw. Beyond general feature announcements that go out to every user, you may want to send additional campaigns to certain segments. Your most engaged customers or VIPs, for example, could get product news tailored to account for their expertise. Or you could follow up with people who put in a certain feature request with a personalized heads up about a new release. 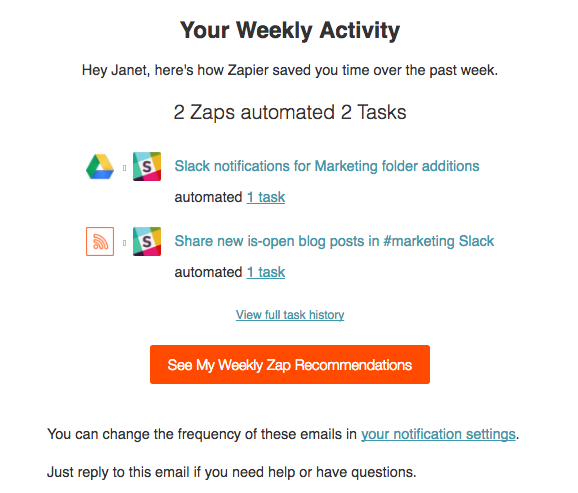 Keep the focus on value, don’t stop at general blasts, and these one-off emails will serve your lifecycle email program well. 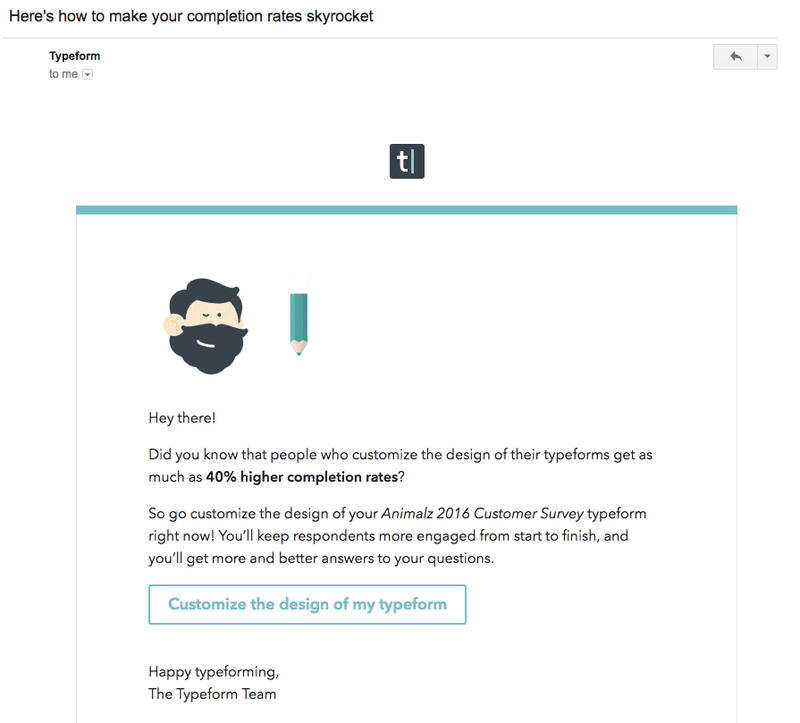 Email is built for two-way communication, perfect for getting input from customers through a survey. A good practice for survey campaigns is don’t ask too much or too often. Otherwise, you’ll see fewer responses and a lot of unopened emails (which is bad for future deliverability!). Set expectations for how much time you’re asking for, so that the reader can make an informed choice. Shorter surveys also make it easier for people to respond. Also, dedicating a message solely to the survey request instead of including it as a secondary CTA in other emails ensures that you’re not diluting your chances. 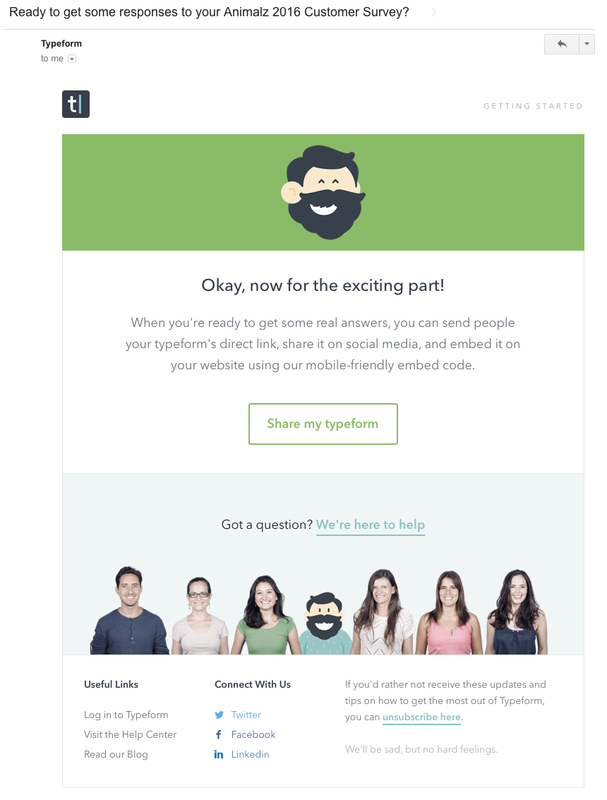 Take a page from Zendesk‘s book and keep this type of message lightweight but focused. Usually, newsletters aren’t lumped into the lifecycle category. But great newsletters are part of a communication strategy to build up positive associations with your brand. There are a few ways to go about this. One is to leverage your content. Help Scout relies on a simple “one post, one email” formula. The messages are designed to be easy to skim, pique your interest, and focus your action on the clickthrough to an interesting read. 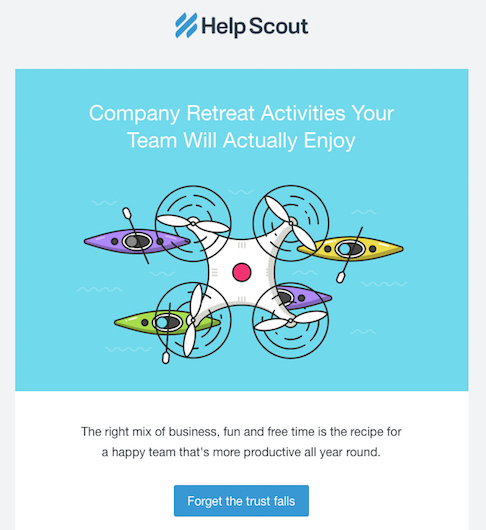 Even if the newsletter email doesn’t get the click, their on-brand blurb and incorporation of relatable topics, bright colors, and snappy copy give recipients a positive vibe about the company. 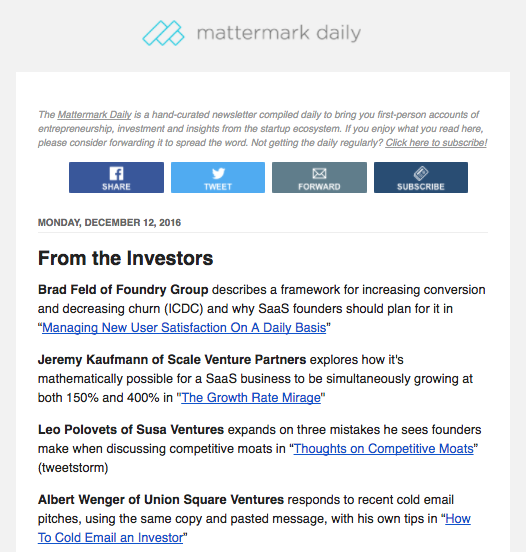 Others, like Mattermark, choose a curated digest. Whether it’s your content or someone else’s, the important thing is to keep providing value and help people feel positive for associating themselves with your brand. Lifecycle email doesn’t have to be complicated. 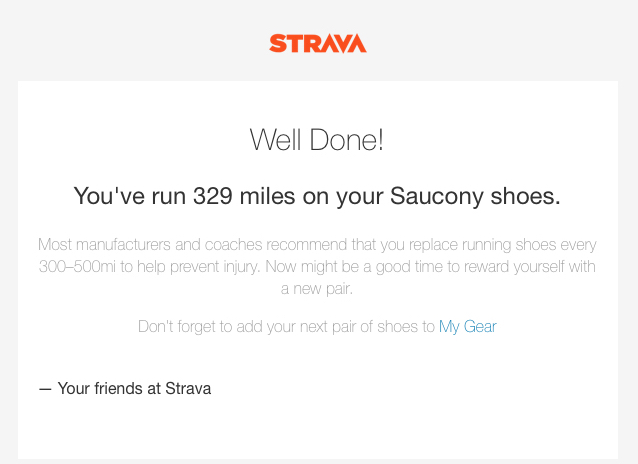 A few automated campaigns paired with a healthy cadence of newsletters, surveys, and updates means that customers won’t fall through the cracks. By pulling all this information to create a comprehensive communication strategy for your customers, you’ll be able to create a lifecycle email program that’s customer-centric long-term and drive deeper engagement throughout the whole customer lifecycle. Who is involved in working on your company’s lifecycle email program? Share with us in the comments!